"My experiences as a student in the School of Music taught me about music, leadership, teaching, teamwork, friendship, worship, life... and so, so many other things. The skills that I learned as a student at Baylor have opened doors for me that I could not have imaginedas an entering freshman, and I am eternally grateful to all that have guided me and continue to support me on this journey." 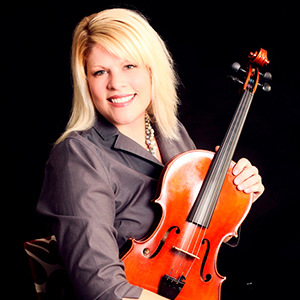 Dr. Blair A. Williams (PhD, The Ohio State University, MM, Kansas State University, BME, Baylor University) is Assistant Professor of String Music Education at Texas Tech University. Her duties include supervising string student teachers, teaching courses in string music education, providing instruction in instrumental/orchestral conducting, team-teaching the upper level music education courses, and directing the Texas Tech University String Project. Dr. Williams has presented invited clinics at the National Association for Music Education National In-Service Conference, the annual American String Teachers Association conference, the annual Ohio State String Teacher Workshop, and the annual Texas Music Educators Association Conference. Her research interests include: rural string music education, music teacher education, secondary music teaching, and viola. She has been published in The American String Teacher and SmartMusic. Dr. Williams is an experienced school, youth symphony, region, and festival conductor. She has conducted ensembles in Texas, Kansas, and Ohio with notable performances at: The Midwest Clinic (2010: The Gold Orchestra; Manhattan, KS), District 2 Junior High School Festival Orchestra (2014, 2015: OH), TMEA Region XVI Middle School Symphony Orchestra (2016: TX), and the upcoming TMEA Region XI High School Symphony Orchestra (2017: TX). Dr. Williams served as Director of Orchestras and the Associate Director of Orchestras for Midway ISD, Waco, TX teaching grades 5-12. Dr. Williams' ensembles consistently received superior ratings at UIL Solo and Ensemble, UIL Concert and Sight-Reading Contest, and other regional music festivals.